We visited KidZania over summer and had a brilliant day out. When I told the kids we were going back for Halloween they couldn’t wait and immediately went in search of their spare KidZos from our first visit. 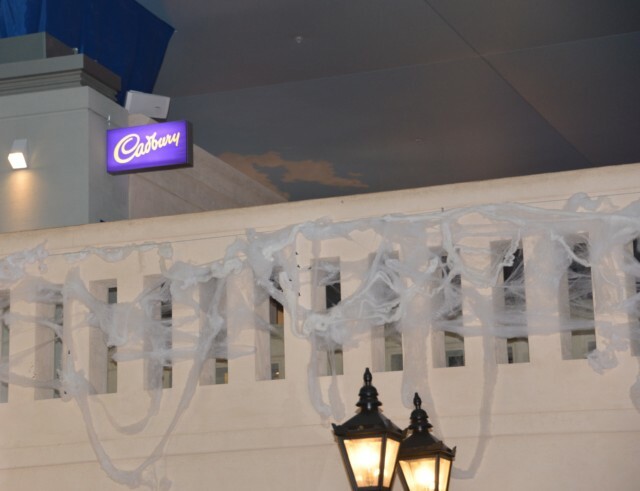 KidZania is easy to find inside Westfield Shopping Centre. We parked easily and had a quick lunch in Nandos before entering the kid friendly city. The impressive entrance is like an airport and never fails to excite my children. We were all given wristbands, which mean the children cannot leave the city without a parent and if you lose track of children inside you can use handy machines to find their last location. This is really helpful when you have three children who often want to go in different directions. For parents whose children are happy to explore alone, there is a lovely coffee shop for adults only where you could sit and work or relax for a few hours. Children over 8 can be left in the city while you shop. 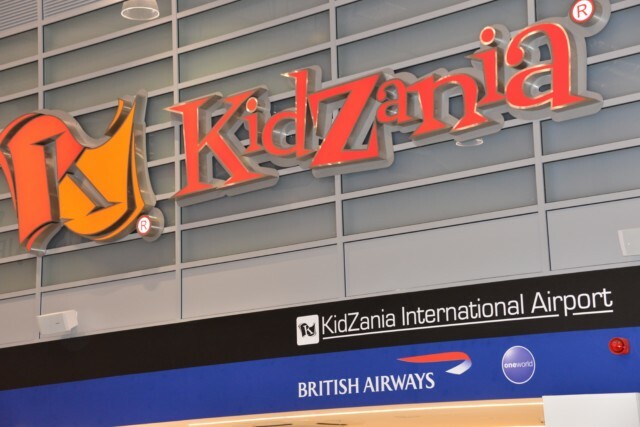 KidZania is a real life role play experience designed to empower children, allowing them to control the airwaves running a radio station, attend Aviation Academy and play inside an actual British Airways plane, learn the ropes in a fire station, work in a dentist surgery, an art studio, a hospital, a fashion studio, supermarket and so much more. My children loved the independence KidZania gave them. My 9 year old was happy to wander around himself finding his own experiences, my younger daughters’ needed a little more help, but felt safe enough for me to leave and return to them when necessary. The city was decorated very spookily with actors dressed as zombies walking around which really got us in the mood for some scary fun. 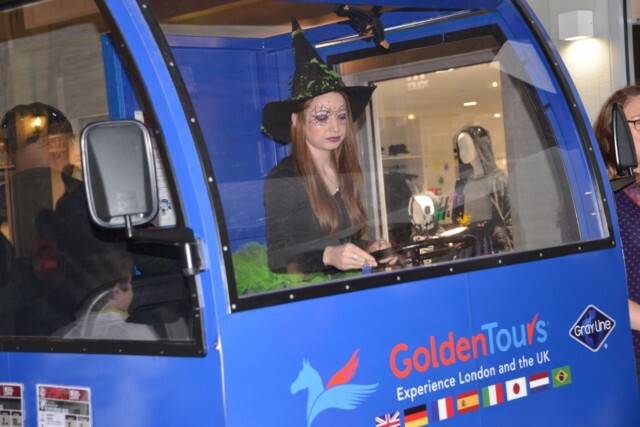 My little girls loved taking part in the creepy Ghost Bus Tour driven by a spooky witch. Children can either be paid to help with the tour or pay 1 KidZo to just enjoy the ride. This was a really lovely experience for both my little girls who really enjoyed being tour guides. 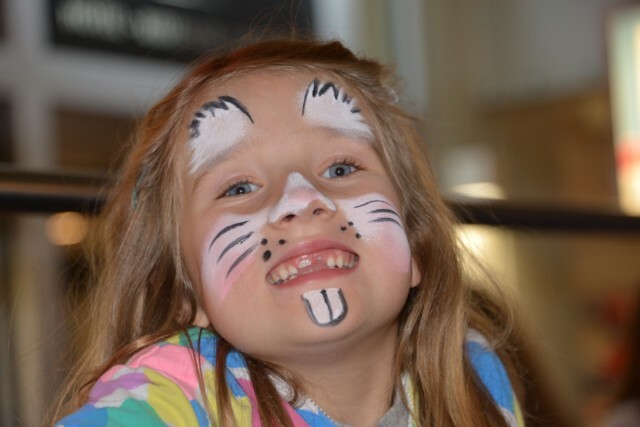 We couldn’t convince Hannah to get Halloween face print, but she loved being a little rabbit. Halloween face print was free, but Hannah used her own KidZos to pay for her rabbit look. KidZania is brilliant for showing children that if they work hard they will be rewarded. 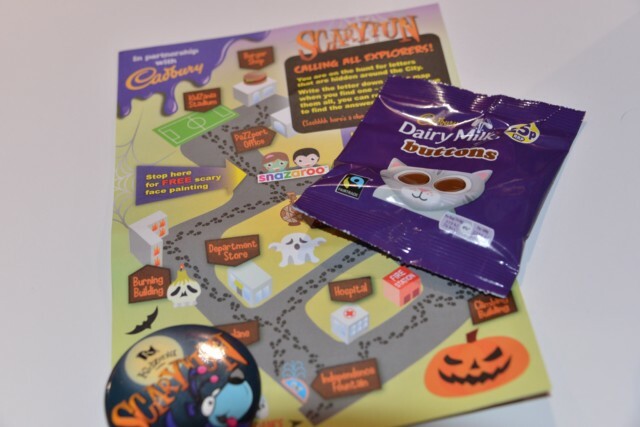 We somehow missed the Trick or Treat Trail leaflets, but the idea was that you search for letters around the city and then as you leave are rewarded with a pack of buttons and a Halloween badge. This was a great addition to the spooky fun and the buttons were very much appreciated for our journey home. One of our favourite non Halloween experiences was the Storks Delivery service. Children dress up like couriers and deliver parcels across the city. 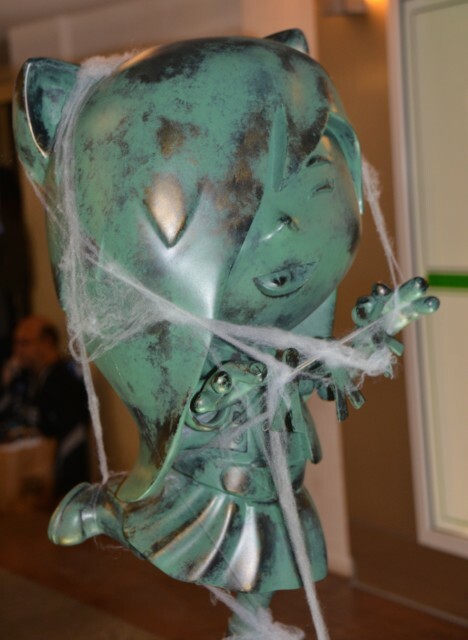 Sydney and Hannah thought this was amazing, especially with the new Storks theme. It was great for giving them the confidence to speak to people as they had to drop the parcels off and get them signed for, often walking into experiences mid way through so had to get the attention of the people running them. We had another great afternoon at KidZania, and would absolutely recommend it to everyone with children. We’ve been twice now and still not tried every experience. Zak played 5 a side football in the stadium this time and the girls made and ate ( most unlike them ) a burger from Gourmet Burger Kitchen. They also all went to the bank to put their KidZos onto a bank card. You need 75 KidZos to do this and then can withdraw KidZos from the cash machine, which made them all feel very grown up and means we don’t have spare money hanging around the house! Thanks to KidZania London for a wonderful start to out half term. I love the fact the kids can work for their experiences. Kids get things so easily these days! Kidzania is brilliant, I love taking my sons, it is nice they can do thing dependently and learn on the job. We have passports now, even thou we have been a few times we still haven’t tried everything. I bet it was busy in the Halfterm but I am sure the Halloween theme was fantastic. Lucy Zelazowski recently posted..We Sing #OwnTheStage, So much fun to be had with this new game! Every time I hear about KidZania it makes me want to go! I bet they go all out for Halloween. I wish I lived nearer. I love Kidzania, I’ve taken my Children there a couple times, there is so much for them to experience and never enough time.